Around the world, communities are all grappling with the same public health challenge: traffic safety. Every year, nearly 1.3 million people die and between 20 million and 50 million more are injured on roads. In 2015, it was the leading cause of death for people between the ages of 5 and 59 after ischemic heart disease, beating out all types of cancer, diarrheal diseases, and HIV/AIDS. It’s a serious problem that has been long overlooked, despite its wide-reaching severity. Luckily, we have seen an uptick in global attention over the past several years. In 2011, Ban Ki Moon launched the UN’s Decade of Action on Road Safety, a global campaign that sought to drive investments and foster new partnerships around reducing road deaths. Research conducted under the initiative found that, in 2013, only 28 countries representing 7% of the world’s population had comprehensive road safety laws on the five key factors that lead to increased road deaths: drinking and driving, speeding, and failing to use motorcycle helmets, seat-belts, and child restraints. This tide, too, is changing. In 1994, Sweden implemented a new policy called Vision Zero, which aimed to eliminate road fatalities and serious injuries in the country by 2020. This model has since been replicated in more than 25 countries across the world. Vision Zero Networks have also been established in the US, Canada, and other countries, which bring together cities who commit to invest resources in pursuit of the Vision Zero principles. In light of all of this progress from the policy sphere, we must understand that road safety remains a major challenge facing every community today – especially in low- and middle-income countries. Innovative solutions are needed to help communities around the world achieve Vision Zero and create safer transport systems. One emerging field trying to tackle this challenge is called Surrogate Safety Analysis. There is an unfortunate pattern in the road safety sector; cities often wait years to collect enough “proof” that an intersection or stretch of road is dangerous or high risk before taking an intervention to improve the safety of the corridor. It’s understandable – cities do not have unlimited resources, and without actual incidents that result in fatalities, injuries, property damage, or police reports, it can be very difficult to collect enough data to identify high priority risk areas and understand the appropriate intervention needed. Surrogate Safety Analysis techniques attempt to shortcut that data collection cycle by identifying specific surrogate indicators that are highly correlated to risk of accidents and occur much more frequently than physical conflicts, but might otherwise not be reported through the traditional channels. To better understand the idea of surrogate indicators, we can look to the medical community. The Transportation Research Board’s Subcommittee on Surrogate Measures of Safety discuss this analogy in their 2009 paper, “Surrogate Measures of Safety”. Most people are familiar with the idea of using cholesterol to measure a person’s risk of having a heart attack or heart disease. It is impractical to wait for people to have heart attacks to begin to treat their heart disease – by that point, it is often too late – which is why doctors look at cholesterol to monitor heart health and prevent more injurious or even fatal events from occurring in the future. Similarly, we can develop indicators that measure risky events that can be linked to likelihood of accidents occurring. By improving high risk intersections and stretches of road, we can reduce the rate of risky events, thereby preventing accidents and road fatalities. Additionally, these risky and unreported events happen at much greater frequency than unfortunate injurious or fatal collisions, which means that data that would otherwise take years to collect can now be collected in a matter of days or weeks. At Brisk Synergies, we have developed indicators to quantify the riskiness of intersections. 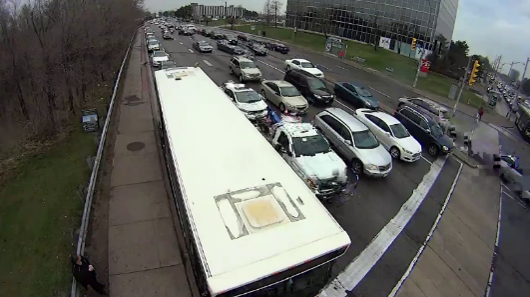 We then use video analytics and machine learning to quickly process vast amounts of footage to analyze these indicator data and provide advice to cities and transport authorities. One of the key surrogate factors we look at is called Post-Encroachment Time (PET). PET is the amount of time between any two objects, such as a pedestrian and a car or a bicycle and a bus, passing through the same point in space. The less time that elapses, the higher likelihood that there could have been a conflict. Using PET, we identify where conflict hot spots are in a given intersection. Perhaps we notice that a majority of the riskiest conflicts – the incidents with the lowest PETs – occur when cars turn left and nearly come into contact with pedestrians in the crosswalk. We have identified a hot spot and can now work with the city to develop the best intervention to avoid those conflicts in the future, like a left turning signal or adjusted timing on the crosswalk countdown. 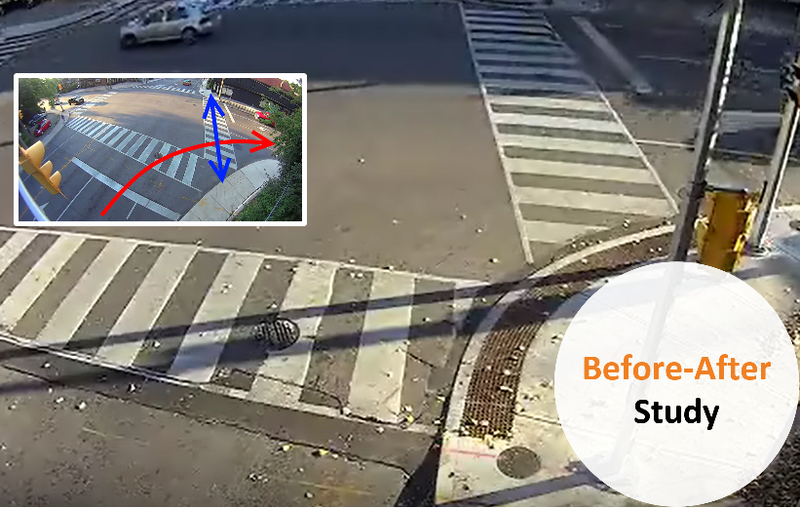 Turning Safely in Toronto: In Toronto, we conducted a study of 2 intersections with similar geometries using a total of 144 hours of video footage. 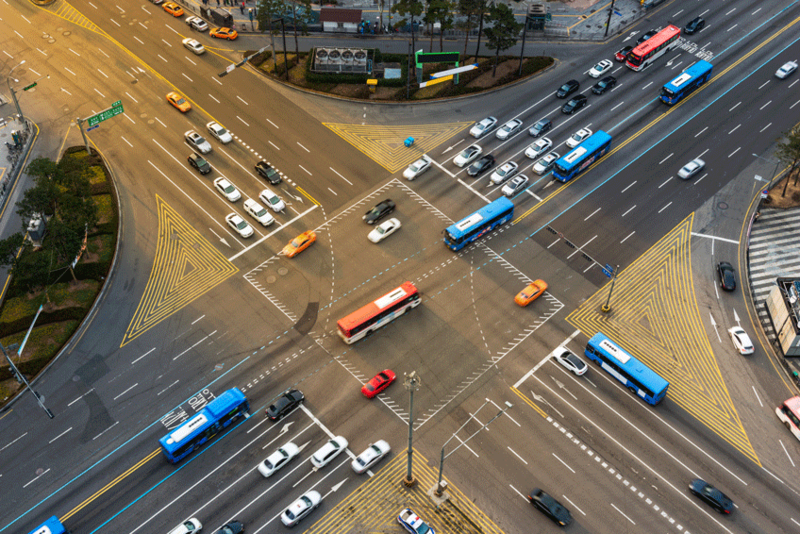 We found that both intersections had similarities in their high-risk areas – drivers quickly turning right into a crosswalk and having near misses with pedestrians. We identified that by reducing the radius of the corners, drivers were paying better attention before turning right, and thus had a decreased chance of coming into conflict with crossing pedestrians. One of the intersections had pedestrian crossing signals. At this intersection, the rate of low, medium, and high-risk conflicts were reduced by 72%, 38%, and 30%, respectively. At the other intersection that had no crossing signals, the conflict rates were remarkable: 90%, 100%, and 100%. Interestingly, there was no noticeable change in turning speed. Safe and Efficient Bus Stops in Toronto: Another case in Toronto looked at a busy intersection with a bus stop. When buses were at the stop at the corner, especially at busy times, queues of traffic had a tendency to accumulate behind them, which caused some people to bypass the queue and turn right from the middle lane in front of the bus’s path. These illegal turns are dangerous, often putting the turning cars in conflict with pedestrians they’re unable to see on the other side of the bus or with the bus itself, should it begin to drive away. By using our tool to observe and analyze the intersection’s traffic patterns, we were able to determine the frequency with which these issues occur and the impact a potential redesign could have in terms of safety and congestions. Safer Pedestrian Crossings in Winnipeg: In Winnipeg, local authorities have two different ways of signaling pedestrian crossings: side-mounted passive signs and overhead-flashing devices. Local authorities are interested to understand the additional benefit of installing both types of sign at a given crosswalk. We are working with the city to evaluate the safety effectiveness of the overhead-flashing devices with and without the added side-mounted passive signs. 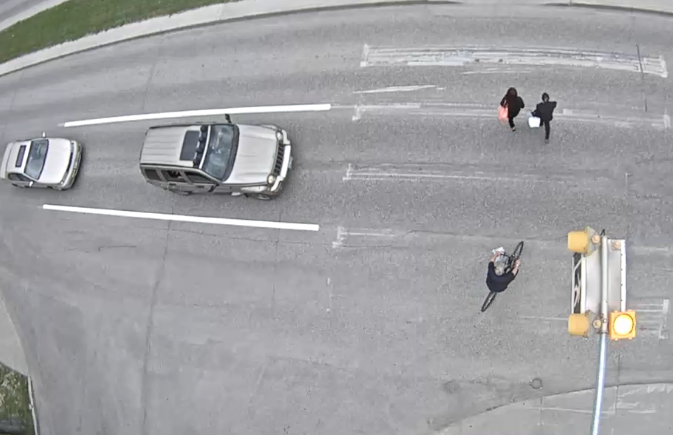 This study will help determine the most efficient and effective way to protect pedestrians and ensure that drivers have ample time and awareness of pedestrians. Surrogate Safety Analysis has the capacity to transform our cities. By using this type of analysis, we can prevent accidents before they happen and make city amenities and the opportunities they offer more accessible to all citizens. Pedestrians and cyclists are the most vulnerable people on our roads and are disproportionately the poorest and most underserved members of our community. Improving road safety for all will improve quality of life, societal well-being, and economic mobility by putting fewer people at risk of having potentially devastating accidents. Imagine a world without traffic accidents. Surrogate Safety Analysis can help us get there. 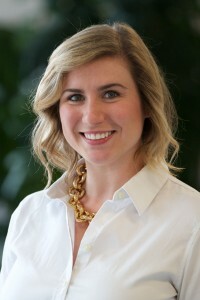 Alyssa Fischer is a Program Manager and Policy Lead at Brisk Synergies. She works closely with cities and international organizations, helping them understand how Brisk’s solutions can help make the world’s roads safer for all people. Prior to joining Brisk, Alyssa worked at the World Resources Institute leading the international policy program for the WRI Ross Center for Sustainable Cities. There, she worked to promote a global transition to safe and sustainable transport systems. Her work highlighted the role green, resilient, accessible cities and transport play in solving the interlinked challenges of climate change, sustainable development, and poverty alleviation. She worked to scale best practices and disseminate lessons learned by promoting these concept in international processes like Habitat III’s New Urban Agenda, the Sustainable Development Goals, Sustainable Mobility for All, and the implementation of the Paris Agreement. Before her work at WRI, Alyssa worked as sustainability consultant for Fortune 500 companies in the pharmaceutical, manufacturing, and retail sectors with ERM. She completed her graduate work at Villanova University where she earned a Master’s Degree in Sustainable Engineering focusing her research on integrating social and economic factors into the traditional environmental Life Cycle Assessment model, especially when assessing public transport systems. She also earned a Bachelor’s Degree in Growth and Structure of Cities from Bryn Mawr College and a Certificate in Nonprofit Management from George Washington University.